In this piece Glenn Peoples looks at the rise of Chris Stapleton's cross genre success with is cover of "Tennessee Whiskey" and how the soulful country number has been able to capture the attention of audiences typically more focused on R&B/soul legends. • “Tennessee Whiskey” plays well with songs in the country, Americana, singer-songwriters, rock, R&B, and soul genres. • Stapleton’s music has a close relation to Etta James and other R&B/soul legends. • “Tennessee Whiskey” has 146 million spins to date at Pandora. • Stapleton has 4.4 million artist stations, 5x his Facebook likes and 19x his Twitter followers. The Beard. I duet with James Harden would be great, wouldn’t it? 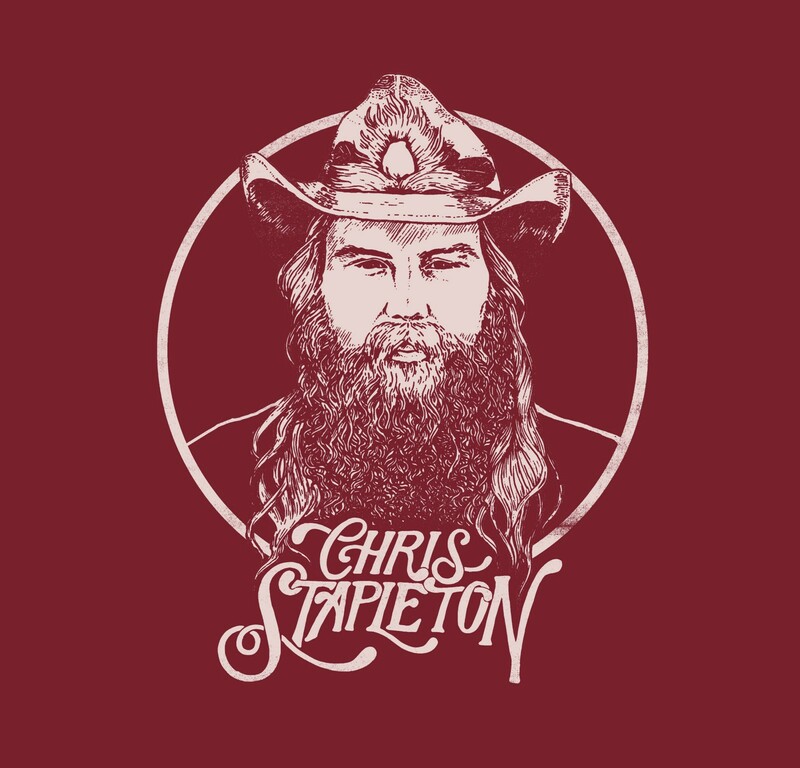 Chris Stapleton, whose third album, From a Room; Volume 2, was released today, struck cross-genre Pandora gold with his cover of “Tennessee Whiskey,” a song that first hit the top ten in the ’80s. In baseball, “Tennessee Whiskey” would be called a five-tool player. In high school, it would traverse a diverse handful of cliques. In other words, “Tennessee Whiskey” is so Pandora: a song that’s spun alongside the music of myriad genres because Pandora’s algorithms can predict which songs go together and be liked by a particular listener. On the surface, there appears to be no relation between “Tennessee Whiskey” and soul and R&B artists such as Etta James and Otis Redding. The songs tell a different story, however. Take James, for example, a singer whose own career spanned R&B, soul, blues, jazz and rock. Listen to “Tennessee Whiskey” and then listen to James’ “I’d Rather Go Blind.” Both songs have the 12/8 rhythmic meter, are in the key of A, and have a chord progression often found in classic gospel and soul music. Stapleton and James have a similar singing style, too. The two are incredibly similar (as has been notedpreviously). So, if you like “Tennessee Whiskey,” you’re probably going to like “I’d Rather Go Blind,” and vice versa. Pandora knows as much. Nearly as similar is James cover of “Misty Blue” — country singers Wilma Burgess and Eddy Arnold each recorded hit versions the ‘60s — that appeared on her final album, 2011’s The Dreamer. Music discovery begins at the code level. Pandora’s ability to find connections between songs works for any artist and any track. The same algorithms that link “Tennessee Whiskey” and “I’d Rather Go Blind” connect Smokepurpp—currently #8 on Next Big Sound’s Trendsetters chart—to Ski Mask the Slump God and Ugly God. Pandora’s recommendation engine connect jazz musician Kamasi Washington to music of the past, such as drummer Idris Muhammad, and new artists like trumpeter Jukka Eskola. Human curators play a role, too, using their insights to construct more even connections. Known as ground zero for the country music industry, Nashville, like Stapleton, has surprising roots and influences. From A Room: Volume 1 and Volume 2 contain music recorded at famed RCA Studio A in Nashville. Founded by country musician/executive Chet Atkins along with brothers Owen and Harold Bradley, Studio A has hosted musicians that traverse music’s taxonomy: country musicians like Dolly Parton and Willie Nelson; crooner Perry Como; and blues legend B.B. King, to name a few. Volume 2again reaches into the R&B genre with a cover of “Friendship,” co-written by Stax Records artist Homer Banks and Stax session musician Lester Snell. His early success came from a songwriting contract with Sea Gayle Music, a successful independent music publishing part-owned by country star Brad Paisley. Over the years, he has written or co-written songs — and hits — for the likes of Thomas Rhett, Tim McGraw, Miranda Lambert, and Thomas Rhett. Later Stapleton signed to record label Mercury Nashville, a part of globe-spanning Universal Music Group. The pieces were in place for a promising solo career. “Tennessee Whiskey” started as a slow burn. “The song didn’t get blown out too quickly,” said Rachel Whitney, Pandora’s country programmer. Instead, the song grew organically — people liked it and gave thumbs up. Curators took that data into account when programming country and other genre stations. A virtuous cycle ensued: this more diverse audience provided additional feedback that helped the song extend to more Pandora listeners. As a result, curators then had even more data to strengthen their support of the song. Repeat the steps: spin, feedback, spin, feedback, and so on. Chris Stapleton performs with Justin Timberlake at the 2015 CMA Awards. If you haven’t seen, watch it now! Then Stapleton had a career-changing moment at the CMT Awards in November of 2015. With Justin Timberlake at his side, Stapleton performed a blazing, eight-minute performance of “Tennessee Whiskey” and Timberlake’s “Drink You Away” with a soulful, Southern swagger rarely seen in popular country music. Not only did the telecast have 14.3 million viewers, the highest in three years, but the video of the performance went viral in the following days. Publications with little mainstream country coverage shared it with their readers. Rolling Stone — not Rolling Stone Country — called it “stunning” while The Los Angeles Times proclaimed it “the buzziest performance” of the evening. The next week, “Tennessee Whiskey” rose to #1 on the Hot Country Songs chart, a mix of sales, streams and radio audience, and also hit #1 on the download chart. The airplay and digital success pushed “Tennessee Whiskey” to #20 on the pop chart, a triangulation of radio, downloads and streaming activity. Country programmers and listeners weren’t as smitten, however — the song reached only #57 at country radio. “Tennessee Whiskey” has a big and growing presence at Pandora. The song’s daily audience is 8x its AM/FM audience and has steadily risen over the past two years—just as would be expected from a song that plays well with many genres and spreads organically. His timing couldn’t have been better. After a decade of party-friendly bro country, Nashville started finding success with album-oriented artists that live outside the bounds of mainstream country. Mercury Nashville had success with Kacey Musgrave’s solo album, Same Trailer, Different Park. Although she has had little success at country radio, Musgraves attracted outlets that typically ignore mainstream country — a feature in The New York Times Magazine, for example. Similarly, the debut album from Pistol Annies, a Miranda Lambert side project with Ashley Monroe and Angaleena Presley, went gold without the help of country radio. Two other artists live outside the Nashville beltway. Simpson’s independently-released albums in 2013 and 2014 was further proof of mainstream potential for traditional country music (not to mention that his 2016 major label debut, A Sailor’s Guide to Earth, came from Atlantic Records in New York, not Warner Nashville). Isbell, a torchbearer for the indie label-led Americana movement, received rare mainstream recognition with an album of the year nomination for this year’s CMA Awards. Not that the music on Traveller doesn’t stand on its own two feet, but if released two years earlier it might have arrived too early for the zeitgeist. Now Stapleton is known around America. In fact, he’s so popular he’s in the top 50 on the Easy Listening station, getting about the same amount of spins as R&B legends Aretha Franklin and The Supremes, and pianists David Nevue and Brian Crain. That’s so Pandora.